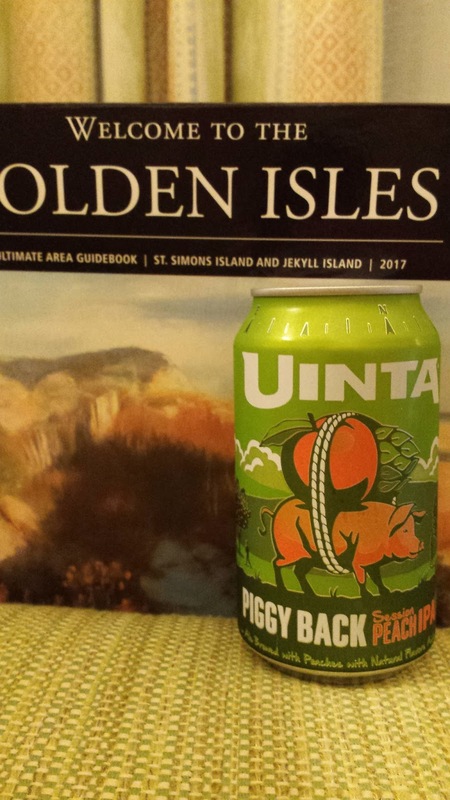 This week's Sunday Night Suds looks at Uinta's Piggy Back Session Peach IPA. 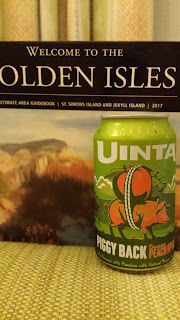 Although certainly it was not my intention when I stopped in a beer store in Georgia's Golden Isles, it was fortuitous/hashgacha pratis to find a new peach beer when vacationing in the Peach State. Although the good folks at BA classify this beer as an American IPA, I would beg to differ. When you flavor a beer with peaches it cannot be a pure IPA. Similarly, when the beer is a "session" it also does not fit neatly within the traditional American IPA category. Since this is a session beer, it falls a little low on the abv spectrum as the Uinta website indicates that it is 4.0% abv. Speaking of the website, it also indicates that the beer is only available for purchase in Utah, but I found this on St. Simons Island in Georgia. The beer has a mellow peach flavor and does not overpower the palate. Having said that, the hops are practically non existent and I almost felt like I was trying a saison. Don't get me wrong, it was positive that the beer was not cloyingly sweet and that there was no clash between the peach and the hops, I just wished that there would be a little more depth to the brew. Uinta Piggy Back Session Peach IPA is certified kosher by the Orthodox Union and bears an OU on the can For the experts' take on this brew, please click here www.beeradvocate.com/beer/profile/1416/239062.